Deciding when and how to spend your money is a big deal, so it’s a good idea to think carefully about these decisions. What do you think of people going over their budgets just to fit in with the crowd? (P1) Just three weeks after graduating from college in 2011, Erin Lowry finally had the chance to do what she’d been fantasizing about for years. (P3) Unfortunately, her dream job didn’t quite come with a dream salary. So to make ends meet, she supplemented her income with side gigs—working 25 hours a week as a barista at Starbucks and babysitting for multiple families on nights and weekends. (P4) In an effort to stretch her limited income—and avoid draining her nest egg—Lowry also focused on living frugally, following a strict budget and taking home Starbucks leftovers at night. (P5) Lowry’s carefully constructed game plan was going well. That is, until she agreed to attend a friend’s birthday dinner. 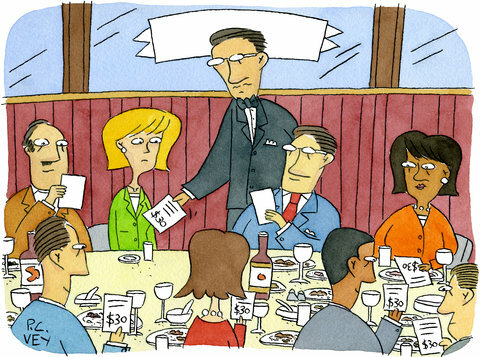 As is often the case with big group gatherings, partygoers wanted to split the check evenly—and Lowry hadn’t budgeted for the expense. (P7) Lowry was faced with a conundrum: Engage in an awkward “I can’t afford it” conversation in the middle of her friend’s joyous celebration, or cough up the cash in order to save face. (P8) Fortunately for Lowry, a friend’s boyfriend asked people to contribute their fair share instead, but the damage was done. “After that, I started to avoid birthday dinners unless I knew a majority of the people in attendance or that I’d only be on the hook for my meal and a portion of the celebrant’s dinner,” she says. (P9) If you’ve found yourself in a similar situation, you’re not alone. (P10) It turns out that many people (78% of Millennials, to be exact) feel the pressure to keep their spending in line with their friends’, according to a 2013 study from the American Institute of CPAs and the Ad Council—even if it’s at the expense of their own financial well-being. (P11) In fact, a 2013 CouponCabin survey found that nearly 10% of those polled actually went into debt just to attend someone else’s wedding! (P12) Translation: Americans seem to be getting a bit too comfortable with the idea of going into debt simply to avoid social awkwardness and keep up appearances. (P13) It’s a trend that, as in Lowry’s case, has the potential to torpedo even the most airtight of budgets, but there are ways to approach such predicaments with grace and aplomb—and help prevent your social calendar from plundering your hard-earned cash. What conundrum was Lowry in P7? Do you also feel the pressure to keep your spending in line with your friends (P10)? What do you think Lowry should do in her situation?